MYLAPORE TIMES » National Deworming Day observed on Feb 8. National Deworming Day observed on Feb 8. On Feb 8, the staff of Urban Primary Health Centre at C P Ramaswamy Road, Alwarpet observed the National Deworming Day. They conducted a mass deworming drive by freely distributing the Albendazole (deworming) tablets to all the 14 schools, 3 colleges and 16 anganwadis coming under their ward (123 and a part of 119). Children in the age of 1 to 2 years were given 200 mg of Albendazole. And 400 mg of the same tablet was administered to children and adolescents in the age of 2 to 19 years and above. 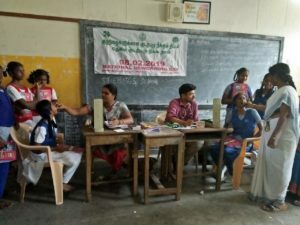 At St. Ebbas Girls Higher Secondary School, Dr Radhakrishnan Salai, Mylapore the doctors first checked the children for any chronic disease before giving the tablet. ORS (Oral rehydration solution) and other necessary tablets were given to the girls who felt the sensation of nausea or vomiting after deworming. “It indicates the presence of a large amount of the parasitic intestinal worms, so it is very important to give the tablets once in six months, to reduce the prevalence of these soil-transmitted helminths (intestinal worms),” said a doctor. The annual medical check-up was also held at this school after the deworming drive. The drive happened simultaneously at all the places from 8 am to 3 pm. For the children who were absent on Feb 8, the tablets will be given on the mop-up day which will be held on Feb 14. This entry was posted on Saturday, February 9th, 2019 and is filed under Civic, Schools. You can follow any responses to this entry through the RSS 2.0 feed. You can skip to the end and leave a response. Pinging is currently not allowed.